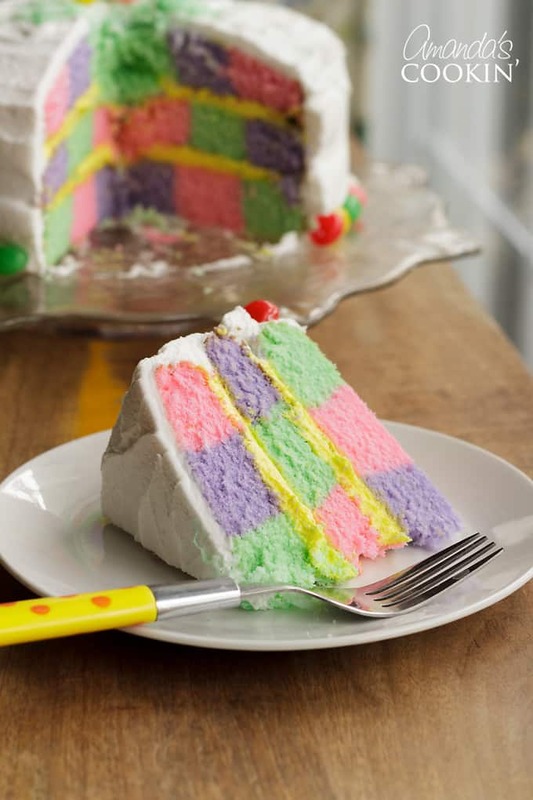 Checkerboard Cake: the perfect colorful cake for Easter! Checkerboard cake is often made with yellow cake and chocolate cake, which makes for a striking contrast. I wanted to try something different this time, I had something more colorful in mind. 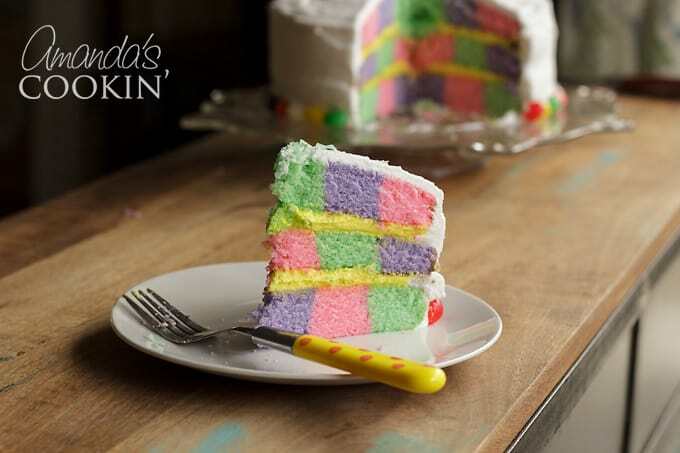 With Easter right around the corner, I thought this was the perfect opportunity to make a pastel checkerboard cake! You can even use the remaining batter from this recipe to make some of these adorable Easter Bunny Cupcakes! 1) I made one batch of cake batter and came up a little short. So I made another batch and poured the leftover batter into a 9″ square pan and made a square cake. I even swirled the different colors to make a marble cake! You could make cupcakes out of the rest if you like. The instructions below WILL leave you with leftover batter. 2) You can use any white cake recipe that you want, particularly if you have a favorite. 3) Important – This is a double batch cake, you might want to split the cake recipe in half and do it in two batches, as it might be too much for the mixer. It was fine in my KitchenAid but the bowl was definitely full. I wanted to give you a head’s up. 4) I used liquid measuring cups to distribute the colored batter because the pour spouts made it a bit easier. I have also seen people use decorator bags. 5) Save the egg yolks for making ice cream! Center a rack in the oven and preheat the oven to 350 degrees F. Butter three 9-inch round cake pans (these come in the Checkerboard Pan Set) and line the bottom of each with a round parchment or wax paper. Place the checkerboard cake insert into one of the pans and set aside. In a separate bowl, whisk together the buttermilk and egg whites. Put the sugar and lemon zest into your mixer’s bowl or another large bowl and rub them together with your fingers until the sugar is moist and fragrant. Add the butter, and working with the paddle attachment, or with a hand mixer, beat at medium speed for a full 3 minutes, until the butter and sugar are very light. Beat in the extract, then add one-third of the flour mixture, still beating on medium speed. Beat in half of the milk-egg mixture, then beat in half of the remaining dry ingredients until incorporated. Add the rest of the milk and eggs, beating until the batter is homogeneous, then add the last of the dry ingredients. Finally, give the batter a good 2-minute beating to ensure that it is thoroughly mixed and well aerated. Separate the batter evenly into three separate bowls. To add paste food coloring, take a small amount (smaller than a pea, it doesn’t take much!) and whisk it into the white batter. Repeat for the other two batches. I used pink, purple, and green. Starting with the pan that has the checkerboard insert, fill the center hole halfway with pink batter. Fill the center ring halfway with green and the outer ring halfway with purple. Carefully loosen the insert’s “legs” from the side of the pan and lift the insert straight up into the air. Rinse and dry the insert and place it into the next pan. In keeping with your pattern flow (pink, green, purple, etc) fill the center hole halfway with green, the second ring with purple, and the outer ring with pink. For the last pan, continuing the pattern, purple in the center, then pink, then green. I used paste food coloring to tint the batters and frosting, and a checkerboard baking set to create the cake. 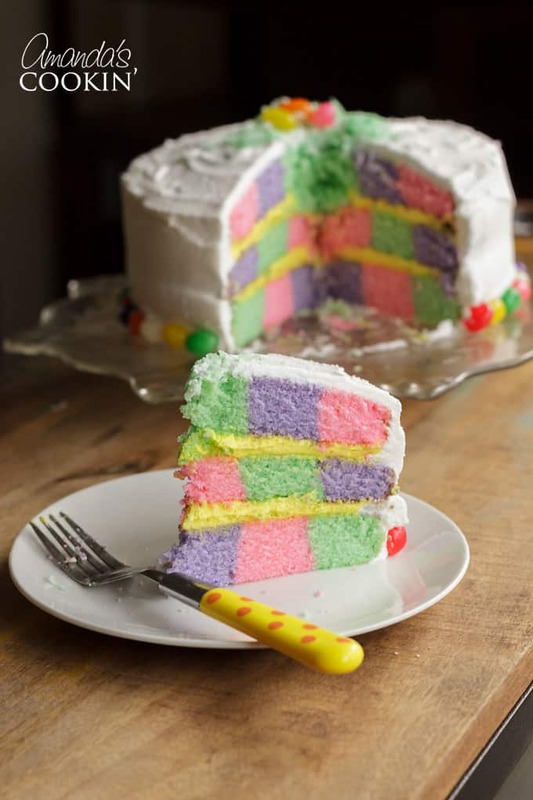 However, if you don’t want to buy a pan, this tutorial will show you how to make a checkerboard cake without it. Instructions for the frosting are in the printer friendly version of the recipe below. Didn’t it turn out beautifully? The end result is worth every second you’ll spend on this recipe! It’s definitely one that people will be impressed by, I hope you have a blast making this Checkerboard Cake! Looking for more delicious Easter treats? Don’t miss these adorable Rice Krispie Nests. Here’s a Carrot Cake Trifle that’s perfect for Easter dessert. 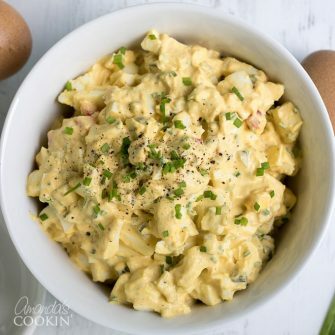 We have too many to list here, so be sure to check out all of our Easter recipe ideas! 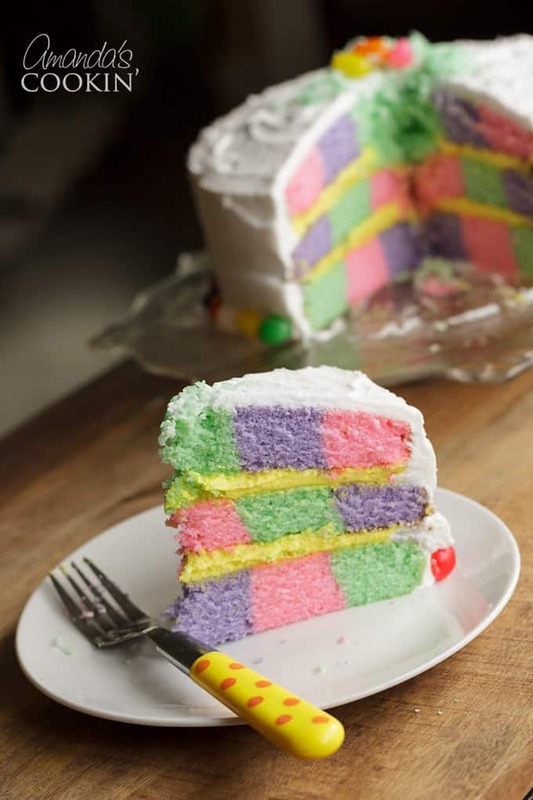 This Checkerboard Cake is the perfect treat for Easter- impress your friends and family with a colorful cake for the holiday! Butter three 9 inch round cake pans (these come in the Checkerboard Pan Set) and line the bottom of each with a round of parchment paper. Place the checkerboard cake insert into one of the pans and set aside. Put the sugar and lemon zest into your mixer's bowl or another large bowl and rub them together with your fingers until the sugar is moist and fragrant. Add the butter, and working with the paddle attachment, or with a hand mixer, beat at medium speed for a full 3 minutes, until the butter and sugar are very light. Separate the batter evenly into three separate bowls. To add paste food coloring, take a small amount (smaller than a pea, it doesn't take much!) and whisk it into the white batter. Repeat for the other two batches. I used pink, purple, and green. Starting with the pan that has the checkerboard insert, fill the center hole halfway with pink batter. Fill the center ring halfway with green and the outer ring halfway with purple. Carefully loosen the insert's "legs" from the side of the pan and lift the insert straight up into the air. Rinse and dry the insert and place it into the next pan. Beat shortening and extracts until creamy, about 1-2 minutes on medium speed. Slowly add 2 cups of the powdered sugar, then 2 tablespoons of milk, 2 more cups of powdered sugar, then the remaining milk and any additional powdered sugar that may be needed. Put 1/3 of the frosting into a separate bowl and tint it with a small amount of yellow paste food coloring. Frost in between the layers yellow and the sides and top of cake white. Mix coconut with one drop of green food coloring. Place tinted coconut on top of the cake and add a few jelly beans. 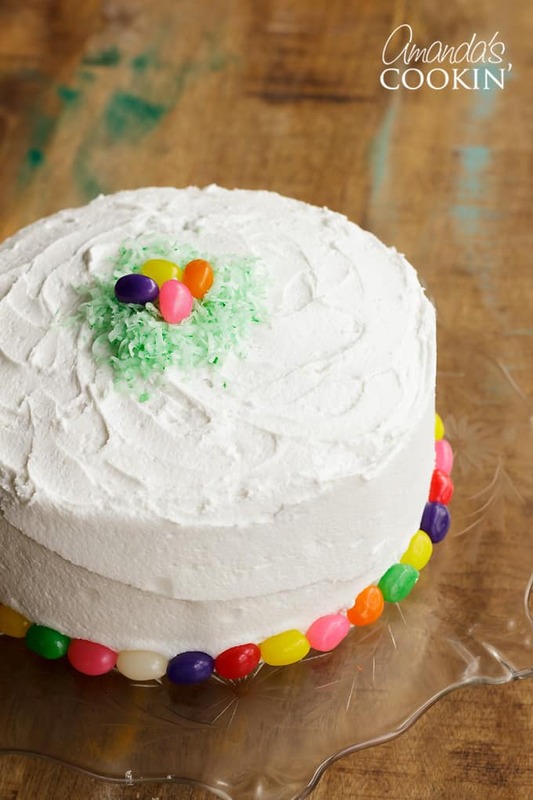 Decorate the outside bottom edge of the cake with jelly beans. This is a double batch cake due to it having three layers. You WILL have batter left over. Divide the remaining batter among 12 cupcakes and bake for 18-22 minutes or until a toothpick poked into the center comes out clean. This post was originally published on March 23, 2010. Hi! our family has a tradition – going back at least 60 years (maybe longer!) 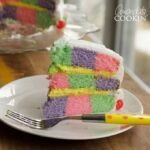 – of having checkerboard cakes! I still have my mother’s checkerboard cake forms and have shared them with my daughter numerous times. Ours is a birthday tradition and we also use it for special occasions. Typically, we’ve used white/yellow cake mix and chocolate cake mix (both have to be the same brand and line to work without ‘slumping”), we’ve also used the regular food coloring (since gel wasn’t invented that long ago!) and never had a problem with the “chemistry”, basically just make sure you use the same brand (like “Super Moist” or what ever, if you don’t make it from scratch). The reveal is the most exciting part – especially for the grand kids AND their color choices! in between the layers, we typically use pudding … gotta have an excuse to eat it fast! Thanks for reminding me of this wonderful tradition! That sounds like a wonderful tradition, Lori! :) I would have loved to see the reveal as a kid as well, how fun!